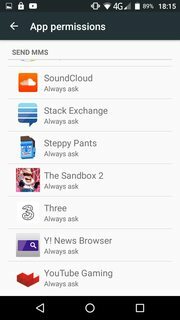 Many, many apps seem to need the 'send MMS' permission, even though there is no clear reason why, including but not limited to the Stack exchange app. Why? Edit: I have read the possible dupe here and although it covers it quite well, so I shall be more specific: Why does the stack exchange app need send MMS/email the, permissions? This question is also in meta Why does the Stack Exchange app need permission to send MMS? Browse other questions tagged permissions mms or ask your own question. What is Google Partner Setup? Why do so many apps use location permissions on a near-constant basis? Should i be worried of these permissions from an app?